Day 1 of World Championships Event Finals – 5 more chances to win! 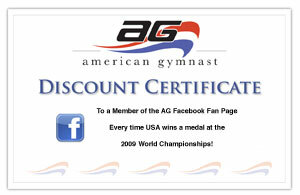 For a chance to win, just join the American Gymnast Facebook Fan Page – it’s Free! Every time USA wins a medal at the 2009 World Championships, American Gymnast will randomly select one of our Facebook Fan Page Members to win a $100 (Gold Medal), $50 (Silver Medal), or $25 (Bronze Medal) Gift Certificate. The Event Finals Competition begins this morning at 8:00am ET. Watch the competition on a free live webcast at UniversalSports.com.